Networking, Connecting, Work, Career, Getting Ahead, Promotion. Networking is an essential component and should play a key part in your outreach strategy and for advancing your career. In today’s increasingly competitive marketplace it should be a part of your daily activity and you should treat it like a full-time job. It is not easy because creating a healthy, productive network takes time, energy, hard work and a full-time commitment. The more you do it the better you will get at it and the more you will find out what works for you and what doesn’t. Networking is all about finding business contacts who have a mutual interest in helping one another. It is about being sincere, genuine, authentic, building trust and relationships and seeing how you can help and be of service to others. Take some time and think about how you can connect with and create value for yourself and others so it’s a win-win outcome. It’s important to keep in mind that a well-connected person creates value for all. Building, developing and cultivating a deep, wide network can not only help you in advancing your career but can also help you recover quickly from a job loss. If you happen to get laid off, are downsized and lose your job and you don’t have a network to reach out to for support, it’s impossible to suddenly create one out of thin air. Below you will discover some of the best networking tips compiled anywhere. They range from basic common sense things to do that a lot of people don’t do, to more advanced concepts you can learn, practice and become proficient at, in your networking activities. If you find real value in these networking tips please share them with others because networking is all about giving selflessly, without expecting anything in return. It’s about helping and being of service to others. When you use this approach you will be developing relationships, connecting with others and building a strong network. And isn’t that why you’re reading this article? So without wasting anymore time, lets begin. As with life, always have a plan. Break it down into activities, like making 3 new contacts a week. Set aside and dedicate time every week specifically for networking. Stay accountable and have a support system by reporting to a friend or set up a buddy system where you support each other. Preparation and research is key to attaining success. Prepare what you’re going to say in advance. Prepare questions and what type of advice you’re looking for ahead of time. Also, think of what you have to offer and ways how you can help others ahead of time. And always keep in touch and follow through. Make a habit of networking, connecting, re-connecting and/or solidifying a relationship with one person every day. After it becomes a habit without you even thinking about doing it, then incorporate it in to your daily routine. The more you do of it, the better you will get at it. Do it in small incremental steps and actions. Do not try to jump in and do too much at once. When you do it slowly and gradually on a consistent everyday basis you will be more likely to have a successful outcome. Take a long term approach to it. Every day have a goal of either connecting, re-connecting, following up, asking for an introduction, being of service and helping others and/or connecting two people that you know might benefit from meeting each other. Start with your warm connections first. Get in touch with and re-connect with old friends, ex-colleagues and former school mates. This way you’re not reaching out and approaching complete strangers. It also gives you a chance to speak to a warmer, more comfortable audience to practice on before you approach people you don’t know. Reconnect with old friends on Facebook and Linkedin. At the start, the real goal of networking is to become comfortable with the process. Do your job well. Take initiative. Be a problem solver. Ensure you have a good relationship with your boss. When opportunities arise within your department or else where in your company, it’s always good to know that you can count on your bosses support and recommendation. Build relationships across departments. Make a list of key people in your company who could be of strategic benefit to you in the future. These could be supervisors, department heads, managers etc. Find a way through a mutual co-worker to be introduced to them. Arrange to have a coffee break or lunch with them for the purpose of getting to know what they do for their job. Slowly build rapport, a friendship, trust and a professional working relationship with them, which takes time. Be nice to everybody. Treat everyone with respect. Get on well with your co-workers. Be open, helpful and supportive. Be well liked, approachable and easy to talk to. Treat others how you would like to be treated. People remember how you treat them and others around you. This will be beneficial to you when you need help, support and allies in the future. Get to really know people and connect with them. Build rapport. Get to know more about them and their business. Make sure that you have made enough of a connection that they will actually remember you when you call later or see them the next time. Continue to build strong relationships with them over time. Earn their respect and trust. The relationships you build now could be beneficial to you down the road. The true, authentic relationships you build will last you forever. When you keep others’ interests in mind, you will be seen as an authentic relationship builder, a genuine attention giver, someone who truly cares about others and is willing to lend a helpful hand. Remember, the well-connected person creates value for all. Give people the recognition they deserve and the credit due when it’s warranted. Recognize others achievements and accomplishments directly and also publicly if you can. When people get promoted, receive an award, hit a major target or challenging milestone or simply just achieve something great, congratulate them. Either say it directly to them or send them a quick congratulatory email. When you speak well of others achievements and accomplishments, people take notice, remember it and will remember you. You will be seen within your company that you’re a true team player who supports others. Make lunch time beneficial to you and use it to your advantage. Try to eat lunch together with a different colleague every day. Try not to eat lunch with the same people each day. Use this personal time strategically, getting to know and gradually building strong relationships with them. For this to be effective you have to be sincerely and genuinely interested in learning about them and hearing their stories. Participate in any training events and try to sit on any committees your company offers. It is a great way to interact and gain more exposure to your colleagues within and outside of your department benefitting you, them and your company. You will be able to interact with them on a personal and professional level which will help to build trust, strengthen your relationships and expand your networking opportunities. Leading a project team is an incredible leadership opportunity within any company. 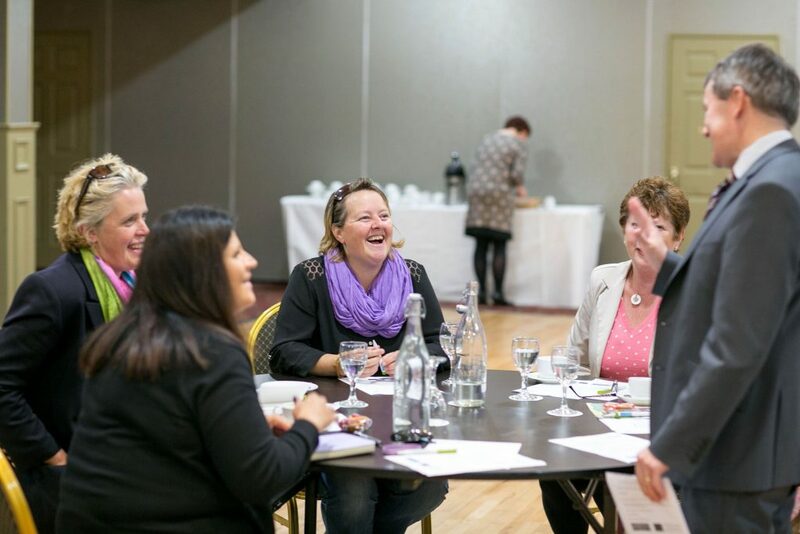 It allows you to interact, build and strengthen your network with colleagues from within and outside your department. You’re provided with an amazing opportunity to lead, collaborate, learn from and support your project team members. It always helps to have someone powerful and influential in your corner to ascend the professional ranks. Mentors offer wisdom and provide advice and guidance but Sponsors have the power and influence to open doors for you and provide you with exciting new opportunities. Sponsors actively look out for your professional interests and seek out new opportunities for you. They put their name, reputation and influence out there to ensure the right people are aware of your accomplishments. They strongly recommend in no uncertain terms that you be promoted, given a raise or the available opportunity. Keep an eye out for executives who respect your talents, accomplishments, potential and what you bring to the table. Periodically, ensure that they are aware of the projects you’re working on. Share with them your strong interest in moving up within your company and your ideas and vision for the organization. With time, this strong relationship can develop into a sponsorship, where you can find yourself on the fast track to being promoted to new, career advancing positions, accompanied with lucrative compensation packages and unlimited opportunities. Consider securing volunteer positions in various non-profit, for profit organizations and sitting on boards of community organizations. This is a great way to increase your profile and to also meet other highly visible, influential and connected individuals. Volunteering allows you to broaden your professional associations by providing access to new networks that may not have otherwise been available or considered. When you participate in a shared activity with the person you’re networking with, it provides the both of you with an opportunity to not only get to know one another but to also build trust, confidence and a real relationship with them. Shared activities bring together a variety of individuals from different backgrounds around a common point of interest and goal. They allow for unrehearsed, unscripted behaviors and instinctive responses to unexpected, unplanned situations and events. They allow you to see the real person and their character. Shared activities that require working together as a team, a reliance or an interdependence on one another, where you have something at stake that brings out the passion in you, builds trust quickly and generates bonds of loyalty are most likely to produce networks and sustain relationships over time. There are numerous ways to participate in and benefit from shared activities. These include volunteering for community groups and associations, helping at charitable foundations, working on cross-functional teams, coaching and/or playing on sports teams, working on non-profit boards, being on work safety committees, getting involved in alumni associations etc. When attending a networking event don’t make the mistake of wasting precious, valuable time only socializing with people you know best and are comfortable with. Quickly touch base with them and then go out and actively search out and approach new contacts. Set a goal ahead of time of how many people you want to meet. Come prepared by asking the organizer of the list of attendees and research them on Linkedin. Have contacts you have in common introduce you to people you want to meet. Know what you’re briefly going to talk about ahead of time regarding yourself and the work you do. But more so, focus and concentrate on your contact and mutual business interests. Your purpose is to connect with them, leaving a lasting impression while all the time trying to find out of how you can be of help and service to them. Good follow up is essential in networking. Use a follow up timeline that is appropriate to each situation. Never let a good lead, contact, referral or opportunity die on the vine because you were too lazy or inattentive to follow up. Your follow through efforts and actions are a direct reflection on who you are. They reveal to everyone involved how serious you are and how much you respect and appreciate what they have done for you. Following through on leads, contacts, referrals and opportunities in a timely manner will make you a stronger networker. Let your contacts know that you enjoyed meeting them and ask if you could get together and share some ideas. Never start selling them immediately. Develop and build the relationship first by finding out more about them. With time pass on valuable information, offering to be of help to them and making introductions. This makes you a more valuable resource to others in your network. Your reputation will strengthen as a resourceful giver. People will remember your value and will remember to reach out to you for suggestions, advice, ideas, names of other people etc. Your visibility increases and you will be on their radar more often. An insular network consisting solely of your industry will only limit your connections. So it’s always best to diversify your network. To ensure you’re building a network rich in social capital, reach out and cultivate powerful brokers and “connectors” or those individuals who can connect you with people that you never would have met otherwise. Be acutely aware that not all of them are in positions of formal authority. Many are in the background, behind the scenes, well connected and wield great influence and power. When your network is diverse, you're more likely to have and know brokers and connectors. These people will be able to help you in a variety of different and better ways. These days, everyone and their mother are vying for the attention of the most successful and influential people. To achieve this your best strategy is to make them come to you. For this to happen you need to make yourself interesting enough that they will want to seek you out. The more interesting you become, the more you’ll stand out, the more that powerful, influential people will want to get introduced to you. The best way to be more interesting and generate others interest is to specialize in a niche and become an expert in a particular field that people value. It could be in your professional field or even be one of your hobbies or interests like SEO optimization, on-line marketing, gastronomy, travel hacking, fundraising, etc. To gain expert status consider writing articles, getting published, starting a blog or teaching in your specialty. This will help allow you to connect with others on a level playing field, who you may have not been able to reach if you weren’t an expert in your field. Become the center of your network where you are the hub and your contacts are the spokes. But don’t make the mistake of being insecure where you try to overtly control complete access to your contacts. Rather, be discriminating and selective in introducing appropriate people to each other. Schedule permitting, periodically bring different people together anywhere from 2 - 3 times a month. Do it over breakfast, dinner, a pot luck, Friday at 5 drinks or coffee or a Meet up group. Start by inviting the most interesting 8 – 10 professionals you know. Then leverage their networks. Ask them to recommend the most interesting professionals they know. With time you will exponentially build and grow a substantial network. Through word of mouth, other professionals who’ve heard of your powerful networking get togethers, will then gradually reach out to you for an invitation, for the opportunity to network with other high-quality professionals that you know. Help others out. Be a Giver. Find ways how you can be of service to them. Connect two people who you think may benefit from meeting. Pass on a job lead or opportunity to someone in your network. Provide helpful information that others may benefit from. Refer them if you can. Follow through with them for feedback. Your relationships will deepen when you help people to connect. When you help others without expecting to get anything in return, people will notice, appreciate, be grateful and will remember you in the future. Your connecting efforts will be highly valued. Except for the Takers, most people will feel obligated to reciprocate and will help you out in the future. Keep in mind that a disproportionate amount of contacts and opportunities will come your way through a relatively small number of contacts. These are your Super-Connectors. It’s the old 80/20 rule kicking in but to more of an extreme where the 20% is closer to 5 -10 %. This is normal because most people don’t have the time, energy, interest, dedication and/or commitment to network at a higher level. So focus and concentrate on these individuals who will provide you the greatest return on your time invested in networking and connecting. It will pay you back big dividends down the line. It’s important to not only establish but also to expand the depth of your networking base. The quality and depth of people you know can be incredibly beneficial when the need arises. Develop strong, in-depth relationships with others so that if you ever need their opinion and advice you will be able to call or email them to draw on their personal experience and perspectives. Develop and invest in these type of relationships regularly, not just when you have an urgent need. Continually expand upon this core group of people that you can depend, rely and count on. As important and effective as it is to build bridges and be the connector between disparate networks, it is even more important to build powerful networking communities. When you form a networking community you ensure that your contacts get to know one another, thus, exponentially increasing everyone’s overall connections and opportunities. The creation of communities eases the managing of networks by having regular meet ups and get-togethers with a rotating group of your networking contacts. So hold events like periodic meet ups and get-togethers for 8 – 10 of your different contacts each time. With time they will all get to know one another. Introduce them, let them mingle and discover new people, all the while helping your networking community expand and flourish. Since you have obviously made it to the very bottom of this post, you must be serious about networking or you wouldn't have wasted your time reading this 3,100 word post. Right? Well the easiest and best way to start off networking is by being sociable and helpful to others. Then why don't you start off by connecting with me? I promise I won't bite! Start by commenting on and sharing this post. I can always use more word of mouth, organic traffic. Then become a part of the Live Love Laugh Be Happy Community by subscribing to receive our newsletter, so you will never miss out on another amazingly helpful post, with great tips, like this one! What are your experiences networking? Which of the above tips have you not incorporated into your networking strategy? Why not? I saw your tweet on TweetedKeyword and thought to check your site. Impressive, looks like Mark has come a long way. Keep the good work going. Thanks for reaching out to me. I did check out your site. You are right, it’s neat because it helps to open up the world to adventurous and exotic places for everyone. Your site has some really visually stunning images. I did also check out your beauty and make up blog just out of curiosity, not that any amount of makeup or beauty tips could help my disposition, hahaha.